There is no lie more dangerous than believing America is a free country. 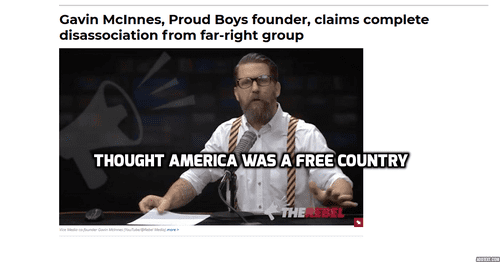 Those who act as if it is swiftly learn otherwise, as Gavin McInnes and the Proud Boyscan testify. And it’s increasingly hard to take pundits and journalists’ condemnations of “authoritarianism” seriously when Americans are already living under an authoritarian system - albeit one more Kafkaesque and absurd than anything existing in Russia or China. To be sure, many VDARE.com readers will find these disassociations far too defensive, particularly the frequent boasts about the numbers of non-whites and homosexuals in the group. The type of journalists who write articles like Why Young Men of Color Are Joining White-Supremacist Groups [by Arun Gupta, The Daily Beast,September 4, 2018] aren’t going to pay attention anyway. As American civic nationalism is magically transformed into “white nationalism” by the Main Stream Media, even a multiracial fraternity that leans right is transformed by journalists into grim-faced monochromatic storm troopers, all protests and photographic evidence notwithstanding. Yet even those who might quibble with the Proud Boys or Milo Yiannopoulos for ideological reasons should be troubled by what is happening. This is from the same playbook as the federal prosecution of the Rise Above Movement, which prosecutors themselves essentially admitted was launched at the behest of Antifa journalists. [FBI arrests white ‘serial rioters,’ by Gregory Hood, American Renaissance, October 8, 2018] The united efforts of the MSM and law enforcement to target dissident groups is a dangerous indication that the “rule of law” so often invoked by the Beltway Right has become as irrelevant to American government as the Constitution. Needless to say, if the attackers are indeed part of a local antifa network, there will be no full court press against them by local or national media. After all, many of these journalists serve as propogandists for these attackers and their comrades. And, despite their constant invocations of “our troops,” Conservatism Inc. outlets and Republican politicians are also indifferent. After all, Antifa serve a useful role for the Beltway Right, making sure that the grassroots sticks to the script and never makes the connection between the mostly white conservative base and the policies that would serve its interests. Yet Professor Christakis himself suffered career consequences in 2015 after his wife questioned whether minority students at Yale were overreacting to Halloween costumes. He ultimately had to step down from his role as master of one of Yale’s residential colleges [The Perils of writing a provocative email at Yale, by Conor Friedersdorf, The Atlantic, May 26, 2016]. Even the title “master” was abolished. Yet what “free and open society?” We are already well past the point where laws are enforced in anything close to an objective way. America is now witnessing the rise of an ideological system that ruthlessly enforces a certain narrative throughout all of society. Dissenters are punished economically, socially, and sometimes physically. It functions very much like China’s “Social Credit” system, with dissenters denied access to online platforms, fundraising services, and even banking services. Consider that a flyer or a leaflet placed by a politically incorrect correct group inspires more outrage and fear than an actual crime. Consider how strange it is that “fake hate crimes” are so prevalent and that entirely new identities are created because people are so desperate to identify as part of an ostensibly oppressed class. Most importantly, consider how journalists, working in partnership with technology companies and self-appointed “watchdog” groups like the Southern Poverty Law Center, regularly police dissident outlets and urge deplatforming and financial sanctions for unapproved opinions. “Democracy” becomes meaningless if media outlets and social networking only allow one narrative to be expressed. This danger is an all-encompassing online orthodoxy. A sameness of thought and approach enforced by hundreds of millions of socially internetworked adherents. A global orthodoxy that ruthless narrows public thought down to a single, barren, ideological framework. A ruling network that prevents dissent and locks us into stagnation and inevitable failure as it runs afoul of reality and human nature. The system in China is not so terribly different from that being created in America, except American-style persecution is largely conducted through quasi-private corporate entities rather than the government. What’s more, it’s countries like China or Russia likely have more free speech than America or Western Europe to discuss issues that actually matter, like human bio-diversity, while the post-West descends into Cultural Marxist hysteria over trivialities like offensive Halloween costumes. The American Conservative Movement could have stopped much of this, at least when the Republican party controlled both chambers of Congress. Unfortunately, Conservatism Inc. is less a political movement than a glorified corporate lobbying enterprise. (Note that Google was a “Presenting Sponsor” of the 2018 Conservative Political Action Conference.”) Regulating tech companies to ensure free speech, enforcing laws objectively (including against antifa), and pushing back against MSM smear campaigns is evidently beyond the capabilities of the Beltway Right—and thus far at least, the Trump Administration. The Historic American Nation is under occupation. The major question facing patriots in the coming years is not how to “Make America Great Again,” but how to survive, build communities, and reclaim some semblance of free speech and freedom of association under a hostile system. The patriotic movement needs to adjust to this reality and start defending the rights and interests of its base. Otherwise, the Proud Boys will not be the last victims of Cultural Marxist Totalitarianism - and even the most “respectable” conservative will not be spared when his turn arrives.